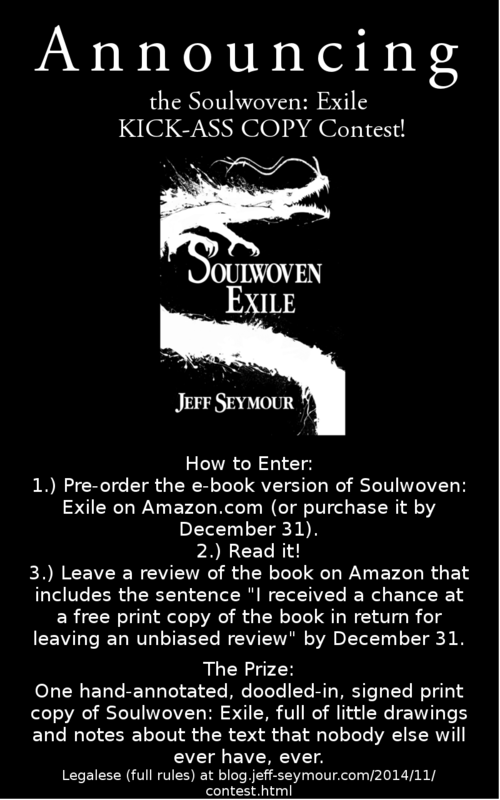 I put up two chapters of Soulwoven this week, to make up for the fact that I'm going to be deep in the woods and out of Internet range next weekend. Unfortunately, Chapter 4 went up a little late, because I spent the weekend being chased off of mountains by thunderstorms and having adventures in automobile repair (if anyone knows what on earth a neutral switch does, other than cause your reverse lights to be on semi-permanently if you confuse it with your reverse light switch while replacing the latter, please let me know). And with that out of the way, on to the craft breakdown for Soulwoven Chapter 4 (Spoilers to follow. Go read it here first!). Chapter 4 is one of several of what I think of as "breather" chapters in Soulwoven. We've just had two chapters of pretty intense action, and I want to give the reader time to take a breath, put the book down (I mentioned I was going to break rules, right?) and go grab a cup of tea, walk the dog, do some math homework, talk to a family member--whatever--and process. I do this because a lot of my favorite books have these moments, and because I want my readers to be thinking. Dan Brown writes great page-turners, but I don't remember having a single productive thought while reading The Da Vinci Code. Neil Gaiman, on the other hand, writes books that I frequently put down, but I gain much more overall from reading them. Somewhere in the middle falls George R. R. Martin, who can keep seven or eight page-turning plots going in every book, but gives me time to take breaks between them as I switch from character to character. So. Action is slower in Chapter 4. Litnig has his dream. It's weird, and then it's scary, and that's about it. The chapter is very short, even by my standards. In terms of plot, I'm working mainly on deepening the mysteries surrounding Litnig. We already know that he had a dream and it was weird. We then ran off on a big adventure through two other characters' heads. I want to remind the reader that Litnig had a dream, and it was important, so I bring them back to it in this chapter. Hopefully, the reader understands that Litnig's dream is not an ordinary dream, and will not be surprised when it keeps popping back up throughout the book. I'm not entirely sure if the repetition and positioning of the dream alone achieves this, but I hope that it does. Because this chapter doesn't have a lot of action, it's also a bit of a litmus test for my writing. I mentioned Martin above. One of the reasons I think he's successful is because he has enough faith in his own abilities to do things like break the tension or kill off major characters and trust that he can keep the reader interested in other ways or develop new characters they'll love just as much. I aspire to that level of writing, and I figure the best way to learn how to get there is to attempt it. In this chapter, I'm counting on two things to keep the reader interested. One is the shock of horror Litnig gets once the dark statue starts moving, but that happens three-quarters of the way through. In the meantime, my writing has to carry the burden alone. For a few pages, my descriptions, my voice, my capability to generate a creepy and threatening atmosphere, are all I'm counting on to carry the reader forward. If I can pull that off, I'll know I'm in a good place as a writer, and the reader, hopefully, will respect the hell out of me. If I can't, the chapter will fail. I don't think I've talked much yet about taking risks in these posts. But as a writer, as a reader, and as an editor, I love writers who take risks. They may (and in fact do, in my experience reading submissions) fail more often than not. But when they succeed, that's where the magic happens. So I do the same in my writing, and I do my best to make it work, and then I cross my fingers and hope for the best. I want to make a brief mention as well that this chapter is more of a horror story than a fantasy story in my mind. I've structured it that way---I start with a character in a situation that he knows is wrong, then allow him to pull himself deeper and deeper into it against his instincts because he can't rationalize why it's wrong, and finally show him why it's wrong when it's too late for him to get out of it without being scarred. Another thing I respect in other writers is weaving multiple genres together, and I'm trying, briefly, to do that here as well. So that's it for Chapter 4! As I said, it's a risk-taking, rule-breaking, genre-bending effort, and I'm more than a little nervous as to how well it works. I'd love to get some opinions on it.